For versatile outdoor lighting, try these Williamsburg Planter Citronella Lanterns. 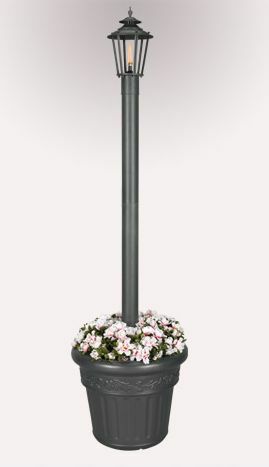 Why settle for an average looking outdoor torch when you can have a stylish torch lantern for your patio that also serves to keep the pests away! Each lantern is 80" tall and 21" wide at the planter base. This citronella planter lantern was inspired by the English turn of the century styling and features a black-colored finish hand applied on a powder coated all aluminum base. These fiberglass wicks will last a lifetime. The base of each Williamsburg Black Planter Citronella Lantern is a planter for your favorite plants. Each lamp has a fill container that will use standard lamp oil or citronella torch fuel. The container holds 16 ounces of fuel which will last through an entire evening under the stars (over 5 hours). Each lantern has a manufacturer's warranty to be free of defects in materials and workmanship for one year from the date of purchase. Please allow 2-3 weeks for delivery. 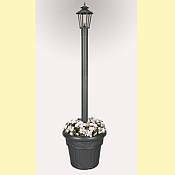 You may purchase a Ground Stake for your outdoor lantern to give it extra stability. .